‘A place to connect with strangers’, that would be my immediate reply if someone asked me to describe Twitter in 6 words. Most of us reading this blog would more or less have clicked on a link on twitter, so the audience is right, please do keep reading, it will get a bit more interesting, I hope. You might have noticed from time to time, a few tweeting, with urgency about an individual (that’s right, not 1000’s, just 1) in need of blood. Most tend to just RT and pass the information to their followers who are active at the time it is pushed out. With a deeper increase on twitter users and usage, it gives a sense of hope for matching blood types and getting at a few to donate their blood. The current methodology does work, I would not argue about it. A number of dedicated twitter handles do push out these urgent information (case in point – @bloodlk, @BloodNeedSL and @thebloodgroup – would encourage those still not following these handles to do so if interested in helping the community as a whole). A tweep organised blood donation event also took place almost exactly an year (in April 2014) back with the hashtag #iDonateLK (more details of it can be traced through that hashtag and this article). What this article is about is to see if we can improve the connection (efficiency and sort of streamline) and time taken to find the donors via twitter. But, this can only be done with the cooperation from the tweeps in our community in Sri Lanka. 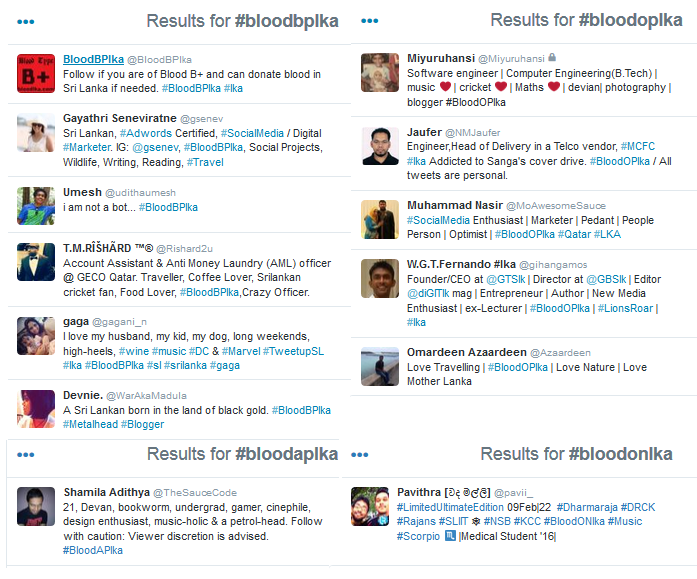 And with the above conversation with @WarAkaMadula we started adding our relevant blood group hashtag. A number of tweeps who noticed this conversation also believed it would be one step closer to finding blood in future and changed their bios (few tweep bios shown below with the blood group added). So what you think? Shall we? Shall we add our relevant blood groups please to the twitter bio? Once this is done, we can easily track the tweeps with relevant blood group and in need, we can approach them directly if needed when the urgency arises. We may never know, it might save minutes in finding one, and those few minutes could be the difference at times, noh? If you don’t agree with the above, you can close the tab to this article. What follows is a Phase 2 attempt which I hope this article would be able to articulate. With the help of @thameera and @Malithsen we now have a website which shows the hashtags in operation realtime. Those curious can surf to the url and see the demands in a less cluttered manner. In addition 8 twitter handles have also being reserved purely for the purpose of RTing the relevant hashtags. The site and these 8 twitter handles are components of Phase 2. Now here is the thing to note. Do not follow…. That’s right, do not follow all 8 if you are keen to get involved with Phase 2. Only follow the twitter handle that is relevant to your blood group or the group that you want to get updates from. We have a small script running which will basically RT a tweet everytime someone tweets with the blood group hashtag (as few like Umesh and Gagani et al have noticed). Now this is where it gets really interesting… (sathhai, ahannako itin). There is just one more step to really turn the wheel in motion. Once you start following, if you are in a position to donate for future callings from tweeps, why not enable mobile (or email) notification for the twitter handle you followed. This means, that even if you are not active on twitter or didn’t see the request, you still get an alert and the request won’t go unanswered. Thereby, we have a more effective blood request system with the help of twitter, a few scripts and most importantly the humble attention and ability of help given by the everyday Sri Lankan tweep.